Bike apparel and footwear up safety while keeping style and comfort in mind for crossover rides. Gas prices are down and bike inventories are up with an expected slash in prices this spring. While we wait to see how that shakes out on the sales floors, now is a good time to look at shoe and apparel trends where the margins can be friendlier. Solid color blocks and horizontal lines continue into 2016’s cycling apparel but smaller brands are making bolder patterns out of topographic maps and tattoo flash art. Triangles are this year’s polka dots. Looking into the future — or at the brighter bikes in Europe — stateside cycling apparel could come to resemble the BMX patterns of the 80s with splashed or splattered colors atop high-vis pinks or greens. Cycling gear continues to offer plenty of neon helmets, gloves, and shoes for high visibility — items easily removed for post-ride socializing. But for apparel, where more lifestyle fashion comes into play, brands are differentiating their high-visibility lines with stylized contrasts of day-glow and darker patterns like chevrons or camo. Brands hope this apparel stands out on the rack as much as on the bike. “Hi-viz yellow is still tops, and pink too, believe it or not,” said Ruth Holliday, co-owner and buyer for Bicycle Pedaler in Wichita, KS. Holliday said her customers are drawn to bright and reflective garments, which contrast a high-visibility base color with a darker color or pattern, and then use reflective elements in high-motion areas. 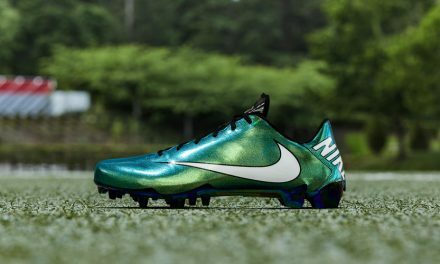 More mills can incorporate reflective threads into more fabrics, and so brands should incorporate those options into year-round garments, not just shells. Some brands pay lip service to the trend with reflective logos and accents, which aren’t visible at safe distances under real-world conditions. Other brands put out second-tier high-vis lines, but leave it off of premium apparel that the dawn and dusk cyclists are arguably more prone to choose. A potential trendsetter among shoes is Giro’s leather laceup shoes with full reflectivity available in two tiers. POC’s Lightflex Vest raised eyebrows at trade shows with its battery-powered light panels printed onto its fabric. The prototype isn’t ready for market yet, but signals that brands are building visibility into apparel, so cyclists are less likely to leave safety features at home. Cycling gear is awash with the buzzwords of gravel, enduro and fondo. Technically, these are race and ride formats, but they share a common thread of longer rides over variable terrain. The trendy words are an industry response to cross-over cyclists; mountain bikers who jump on roads to get to trails, and roadies who want to ride less-than-paved surfaces and still put a foot down safely. There is gear tailored toward these niches, representing a continued shift toward versatility and comfort. Retailers should embrace these products for their enthusiast customers and downplay the specialized hype if it’s not a fit. For apparel, fondo means looser fits and more affordable kits. The styling is less about visibility and flash and more a monochromatic homage to jerseys of the past. 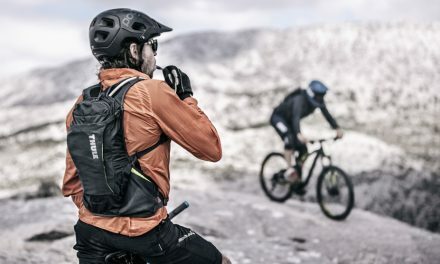 Like the race format itself, enduro lands between downhill and cross-country, and somewhere in the mid-level range of protection in mountain bike shorts. In shoes, technical specs aimed at enduro and gravel grinders introduce EVA foam, different types of flex with weatherproof uppers. Those features exist in other forms, but the shorthand is if it’s comfortable on a six-hour ride, it will be comfortable on shorter rides, too. Mountain bike shoes in general are using more rubber lugs instead of plastic molded cleats and turning to ingredient brands like Michelin and Vibram for outsole treads that can grip slick rock and wet roads. All-terrain features will appeal to a broad audience, from cyclocross racers to weekenders looking for a go-anywhere shoe. For years, bib shorts have been the choice of pros and amateur racers alike, but enthusiast riders have balked at such commitment, even those who shave their legs. American cyclists still haven’t embraced bibs, but the trending demand for comfort and longer rides could help close the gap on regular shorts. Recent fabric improvements lured new converts with mesh uppers and stretchier straps. New bib shorts offer the same cooling and venting strategies, block UV rays and wind. Brands continue to compete with cuts and hems, especially in women’s bibs. New women’s options include straps that widen at the shoulder and lay flat against the body, single front straps, and a variety of easy-off constructions for bathroom breaks. The T.laalaLaiShorts S7 by Assos use wider shoulder straps and a magnetic closure on its center strap. If brands continue to emphasize the technical specs of bibs, perhaps editors, retailers and riders can spread the word on the comfort of bibs — and prevent those tragic jersey-short gaps. Closure systems continue to offer better fits. Shoes that used one dial in last year’s footwear added a second dial this year, but Velcro straps still reign for on-the-bike adjustments. Increased lace-up options fit the ‘new-school tech with old-school aesthetics’ trend. Unlike Velcro, laces and Boa systems can be changed to customize the color of the shoes. That’s an appeal for customers who like to mix and match their looks, and retailers interested in low-cost SKU options that don’t use up space.